UsAgainstAlzheimer’s Network launched ADDEN to build a national network of diverse researchers, patients, caregivers and stakeholder groups for collaboration and knowledge sharing around barriers, facilitators and priorities in Alzheimer’s research, programming, and policy focused on addressing brain health disparities impacting communities of color. ADDEN is partially funded through a Patient-Centered Outcomes Research Institute (PCORI) Eugene Washington PCORI Engagement Award (4192-USAA). Invited to inform and attend periodic network-specific meetings, webinars, and conferences with a focus on information sharing and priority setting. Provided opportunities to share your work, research, and priorities among UsAgainstAlzheimer’s diverse network partners, including policy makers, researchers, community leaders, and industry partners. 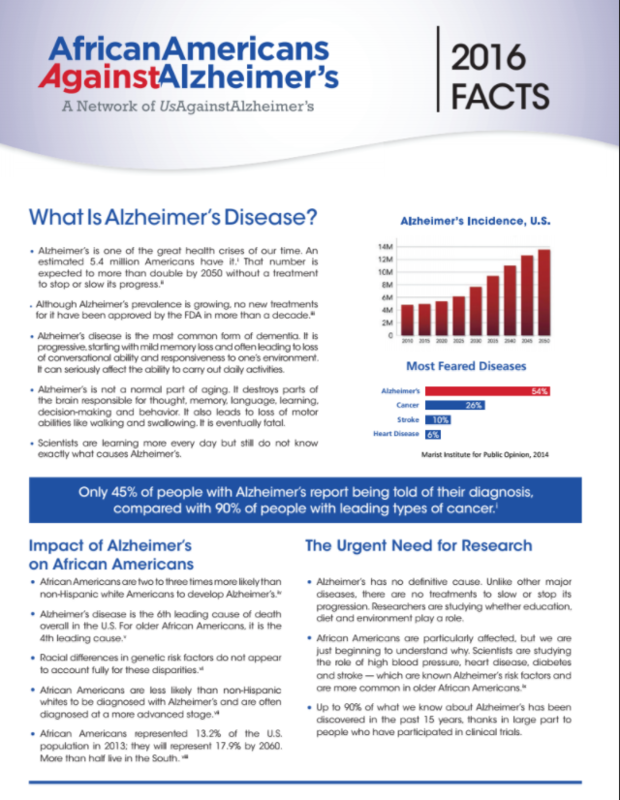 As an outcome of the 2016 Alzheimer’s and Dementia Disparities Summit, UsAgainstAlzheimer’s established three working groups to facilitate continued collaboration between grassroots, grass tops, private, and public stakeholders committed to addressing disparities in Alzheimer’s and dementia. These working groups will provide the ADDEN a platform for monitoring progress, sharing best practices, and adjusting course in our efforts to address the growing impact of dementia and Alzheimer’s on communities of color. The three working groups are: Increasing Public Awareness Awareness of AD Among Latinos & African Americans, Prevention and Diagnosis, and Clinical Research and Trial Participation. 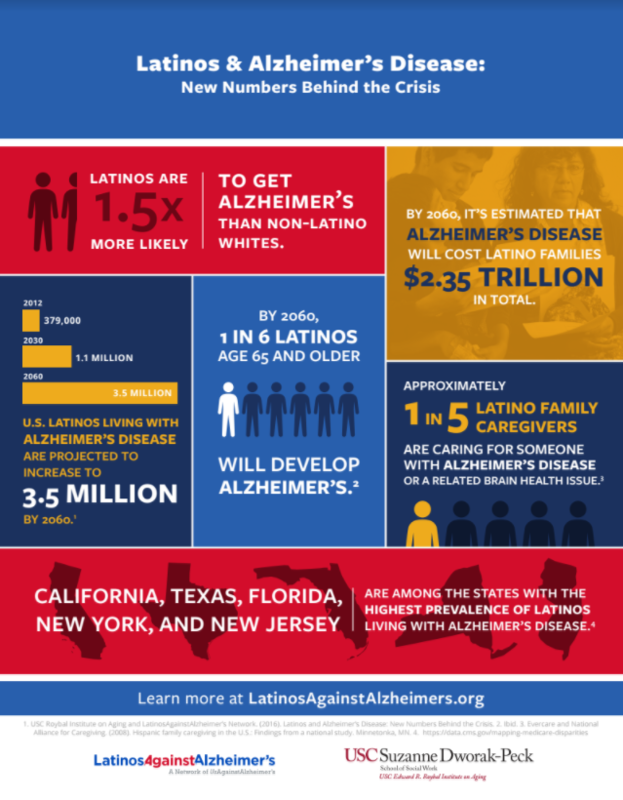 Increasing Public Awareness Awareness of AD Among Latinos & African Americans: This working group will focus on identifying methods, strategies, and policy changes needed to increase public awareness of Alzheimer’s and dementia in communities of color. Prevention and Diagnosis: Working group members will focus on identifying and disseminating strategies for prevention and improving diagnosis rates, addressing the particular challenges that communities of color face when accessing preventative services, treatment, and care for Alzheimer’s and related dementias. Clinical Research and Trial Participation: This working group will address barriers to minority participation in clinical research and trials and will develop recommendations for improving research education, recruitment, and retention by encouraging transparency, making public policy changes, and improving communitybased outreach practices.